Learn more about 240Sweet on their website. Because these marshmallows offer such a delightful lime taste, I thought that I’d go with a pure green tea so that they could compliment each other. I chose this Huang Shan Hair Tip from Arbor Teas … the pleasing vegetative tones allowed some of the avacado notes to express themselves a little better than without the tea, which I really appreciated, and the lime brightened up my tea time! When I placed my most recent order with 240Sweet, I ordered the Chai Spice Marshmallows (of course, I love Chai!) and the Sweet Potato & Ginger and these Avocado & Lime Marshmallows. I ordered the Chai because … well, as I said, I love Chai. But I added the other two to the order out of curiosity. I mean, really … avocado? and Lime??? In a marshmallow? I expected these to look a bit more green than they do, but I guess I can understand why they might not have wanted them to look green … it could easily be misconstrued as possibly moldy. I also expected a bit more avocado flavor to these … what I taste primarily is the lime. These are sweet from the marshmallow and tangy from the lime. These actually may just be one of my favorite flavors from 240Sweet yet! While I am a little sad that I don’t taste avocado here, the way the lime and the marshmallow balance each other out more than makes up for the lack of avocado. The pucker-y tartness of the lime is mellowed out by the sweetness of the marshmallow, and the sometimes cloying sweetness of the marshmallow is tapered by the tangy lime notes. This is one of the best balanced marshmallows I’ve ever eaten! I haven’t really ever made it any kind of secret that I have mad love for 240Sweet. Their marshmallows rock my world! So what’s next on my list as far as 240Sweet goes? Well, I have the Bourbon Sugar Bourbon marshmallows from my Knoshbox still to try. I’m thinking about saving them until I have a chance to stoke up a fire in the fireplace because I’m thinking that these are going to be amazing roasted. But, the next time I order from 240Sweet, I think I want to try their Bourbon Sugar Churro with Cajeta, and the pumpkin pecan sounds amazing too. Maybe I’m going to have to place an order with them sooner than I thought, because I have a feeling that the pumpkin pecan isn’t going to be around much longer … it’s kind of a seasonal thing, right? Oh… and I definitely need to try their Bananas Foster! Oogie’s Popcorn just may be the perfect snack. Made from the highest-quality non-GMO corn, perfectly popped in small batches, it’s delightfully light, airy and crisp with a dash of white cheddar tang. Plus, it’s healthy to boot. 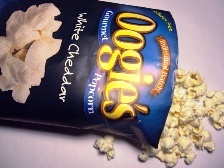 I received this sample bag of Oogie’s popcorn in my November Goodies Box. I usually prefer iced tea when I have popcorn, an icy cold beverage just seems to go perfectly with the salty goodness of popcorn! I chilled some of this Key Lime Ceylon from Fusion Teas, and I thought it made a delicious pairing with the salty, cheesy, spiced flavor of the popcorn. A refreshing and zesty snack! Having previously tried the Sundried Tomato & Parmesan Popcorn from Oogie’s, I was fairly confident that I’d enjoy this White Cheddar gourmet popcorn, also from Oogie’s. I mean, really … what’s not to like? Cheddar cheese & popcorn? YUM! Yes please! The popcorn is light, fluffy and crispy. Each kernel is coated with a seasoned powder that is salty and cheesy, with hints of garlic powder and onion powder, just to keep it interesting. Perfect for when you want a salty snack, I’d take this over potato chips anytime! I really enjoyed this bag of popcorn … and I found that it disappeared way too quickly! It was deliciously savory, and neither I nor my palate felt weighed down after snacking on it – and usually both my palate and I feel a little weighed down after snacking on something like chips, so I’d say that this popcorn, in addition to being a healthier snack choice, is definitely a WIN-WIN! I don’t know that it’s necessarily what I’d consider a healthy snack, but it is definitely better for you than something that’s been fried, like a potato chip. Oren’s Kitchen nuts are high quality, farm-fresh, and uniquely seasoned to create gourmet treats. Their elegance is perfect for dinner parties but their delicious taste will keep you snacking. The coconut chili macadamia nuts have the perfect balance of salty, sweet, crunchy, and spicy. Fresh macadamia nuts are paired with generous amounts of coconut, a hint of honey, and red chili for a hot kick at the end. I received a pouch of this snack mix in my November Petit Amuse Sampler Box, and is available for purchase from Petit Amuse. OK… so this spicy-spicy-SPICY sweet salty snack packs a real punch of flavor, so I wouldn’t recommend choosing something that will detract from that, instead, I would recommend ICED TEA because you will want to refresh your palate! I chose this tea: RadioactiviTEA Southern Boy Teas from 52Teas mostly because it was the iced tea that I had already prepared in the fridge, but I think any unflavored iced tea will do when it comes to refreshing the palate, but what I really liked about this selection is that while it is a good, strong tea, it’s not overly sweet nor does it offer flavors that either get lost or interfere with the distinct flavors of this nut mix. This stuff is good … but be warned, it’s got some KICK to it! I’m not even sure what to call this … it’s not just nuts, because there are big chunks of coconut in there too … maybe a trail mix of some sort? But I don’t know if you’d want to take this out on a trail, only because you wouldn’t want to be too far from a source of liquid refreshment – this trail mix bites back! Its a mix of toasted macadamia nuts and toasted coconut flakes that have been coated with honey and then tossed with red chili flakes! The result is a deliciously crunchy, spicy-sweet-salty mix that burns so good, with a flavor that is positively addictive! Seriously, once you get started eating this, it’s hard to stop. It’s so yummy! The macadamia nuts are sweet, crunchy, salty and delicious. The coconut adds a slightly chewy texture to the mix, as well as it’s own distinctive sweet flavor. The honey adds a touch more sweetness and I’m happy to say there isn’t a sticky texture from the honey here. And of course, the red chili adds some serious heat! It’s a great exploration of contrasting flavors and textures. If you’re one who has a sensitive palate to the spicy side of food, this is not a product I’d recommend purchasing. But, if you’re someone who – like me – LOVES indulging in snacks that explode with contrasting spicy and sweet flavors – YOU MUST TRY THIS! My Goodies Box for November has Arrived! Posted: November 25, 2012 in Goodies Co. The box arrived on the afternoon of November 20th. I was kind of surprised, really, because I have gotten used to the box arriving much closer to the end of the month… but it seems that with each month, the Goodies Box arrives just a little sooner than it did the month previous. I’m OK with that. They’re ironing out the kinks, and still managing to keep the price at just $7 per month. I’ve been happy with this subscription. The theme of this month’s box is “Entertaining Made Simple,” and while I don’t usually do much entertaining (I am agoraphobic, and I usually have trouble with one guest, more than one is positively anxiety-inducing!) I do enjoy the foods one might serve at a dinner party … as they make fantastic tea-time treats. And, incidentally, this box does include a tea! Granted, it’s bagged tea (Hey, Goodies Company, get in the know! Loose leaf is the only way to go!) but it’s still tea. Bigelow Tea’s Pumpkin Spice tea, to be precise. I’ll be reviewing that tea on the SororiTea Sisters blog at some point! The other goodies in this month’s box include: American Vintage Wine Biscuits, Lotus Bakeries Smooth Biscoff Spread, Bobbysue’s Original Flavored Nuts, Pumpkin Souffle Mix from Flourless Bliss, White Cheddar Popcorn from Oogie’s, and a Dark Quinoa chocolate bar from Alter Eco. Yum! Looking forward to these yummy items … and they are all new-to-me! Bonus! We are grateful to have you as one of our first subscribers! To show our thanks we are excited to gift you the enclosed Goodies Co. Farmer’s Market Bag. Yay! I do try to bring my stash of reusable bags every time I shop … sometimes, I forget, but, I do try. And it will be nice to have yet another to add to my stash! It will definitely be put to good use. 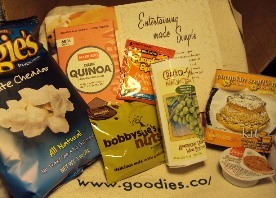 This is the best box from Goodies Co. yet! My husband and I both enjoy Mexican food, and while I’ve enjoyed many of the places that we’ve visited in the past few years, I’m always on the lookout for another place to eat delicious Mexican cuisine. So, when Living Social offers a voucher for a Mexican Restaurant that I’ve not yet tried, I am eager to buy the voucher! Let’s eat! When we arrived at Cha Taqueria, it was too dark to take photos (we dined outside) … I hope that Cha Taqueria doesn’t mind that I borrowed their photo from their online gallery. Please click on the pic to go there! Order: I ordered the Carne Asada Tacos plate ($14) while my husband chose the Chicken Las Rancheras platter ($15). OK, first of all, I have to say this … the parking for Cha Taqueria STINKS! There is no parking lot, so the only parking is along the streets, and we drove around for 30 minutes looking for a parking place! So, if you’re visiting Cha Taqueria, make sure that you arrive in plenty of time to ensure that you can get a parking place and still have time to eat (in other words, don’t do what we did, and start looking for a parking place an hour before the place closes!) We were nearly too late to order, fortunately, the staff was nice and let us dine so that we would not have to return another evening. THANK YOU Cha Taqueria for being so considerate of our parking plight! After shaking off the annoyances of the lugubrious parking situation, we decided not to allow it to taint our dining experience since the staff was so pleasant and kind. We sat outside – it was a lovely evening! – and placed our order. Instead of the customary chips and salsa that most Mexican restaurants serve before the meal, we were brought a platter of chips topped with melted cheese and beans. This was absolutely delicious, and really put us in the right mood for the yummy food that would follow. Our food arrived surprisingly fast. The Carne Asada plate was comprised of two soft corn tortilla Carne Asada tacos and black beans. The steak strips were incredibly tender, it seemed to melt in my mouth! The flavor of the taco was balanced out with a light squeeze of the lime garnish, this gave it just the right acidic touch to brighten up the flavor of the taco – the meat was succulent and tender, the vegetables were crisp and the salsa provided was SPICY … be sure to use this sparingly! My husband gave me a bite of his Chicken Enchilada and the chicken was even more tender than the flat iron steak in my Carne Asada Tacos. Absolutely delicious! My husband and I both really enjoyed our meal at Chai Taqueria and I daresay that we’d be happy to visit again … but next time we will be mindful of the parking situation! The food was absolutely vibrant, tasted so fresh and delicious! This limited seasonal release sells out at every Connecticut farm market Nate’s Naturals attends. After making granola for over 20 years, they decided to start selling the delicious creations in 2008. An electrical engineer by trade, Nate knows that even the smallest details matter. Made with organic rolled oats, wheat germ, oat bran, sunflower seeds, honey and a touch of molasses. They then add real pumpkin puree, pumpkin seeds and pumpkin pie spices. These natural & local ingredients are then baked slowly to toasted perfection. I received a pouch of this Happy Jack Granola in my October Knoshbox. While snacking on this granola right out of the bag, I chose something refreshing to sip along with my snack. I chose this green tea: Kenya Rift Valley Green Tea from Grey’s Teas because I hoped that the fruit notes of the tea would accent the granola in a beautiful way … brighten the flavors and help coax the pumpkin notes to express themselves. I was right – the sweet pumpkin notes seemed to really pop! – and I was very pleasantly rewarded. 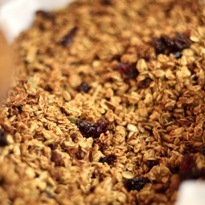 For the purposes of this review, I tried this granola a few of different ways. First, I tried it right out of the pouch by the handful. YUM! Then, I tried it sprinkled atop some plain, unflavored yogurt, and finally, I tried it as a cereal: in a bowl with milk. Generally speaking, I like granola, so I was pretty sure I’d enjoy this offering from Nate’s Naturals. I didn’t really get a good look at the product or read any information about it until I opened the pouch to try it … so I was surprised to learn that this is a pumpkin granola. I can’t recall ever trying a pumpkin granola before! I think I prefer this as a yogurt topping than as a cereal, mostly because I wasn’t really fond of how the pumpkin seeds tasted in the milk. It was OK as a cereal, but it really was amazing as a yogurt topper. The tangy notes of the yogurt provided a delicious contrast to the sweetness of the granola, and I loved the different textures: smooth, creamy yogurt, chewy raisins, crunchy granola … I had purchased this tub of yogurt originally to make smoothies, but I might end up using it all for with this granola before I get a chance to blend a smoothie! Then again, it is really tasty as a snack, right out of the bag. It is crunchy but not too hard, and I love the toasty taste. It is sweet and lightly spiced, and every once in a while, I bite into a cranberry and I get a lovely tart note that sort of brightens it all up. But what makes this granola truly special is the pumpkin. Not just pumpkin seeds or pumpkin pie spice, this is made also with pumpkin puree, and you can taste a little bit of pumpkin goodness in every single bite! It isn’t an overwhelming taste, but it does give a really nice, unique flavor to this granola. I really enjoyed this granola. It makes an awesome yogurt topper, and it’s quite tasty right out of the bag. I see that Knoshbox is currently sold out of this granola, which is too bad, because this is delicious … something I’d definitely consider repurchasing! 240Sweet Marshmallows are available on the 240Sweet website. When they’re not serving as a fluffy, delicious cap to my hot cocoa, I usually prefer to eat marshmallows with a cup of hot tea. However, the heat from the ginger on these gives me cause to want something that is easy to “chug” … lest I need to cool the palate immediately. So I chose a white tea because even when served hot, I prepare it at a cooler temperature than I do other tea types, and white tea tends to offer the body and palate cooling properties. I chose this amazing Organic White Tea from Steenbergs Organics. The sweet, crisp flavor of the tea offered lovely refreshment from these deliciously sweet yet spicy puffs. I think I may have mentioned before that 240Sweet makes my favorite marshmallows. And it’s not just because the marshmallows are huge and fluffy and perfectly sweet. It’s not just because 240Sweet has managed to create works of art with their marshmallows. Sure, these reasons factor in to why I love these marshmallows so much, but there’s something more to it too. It’s their gutsy approach to marshmallows. They’re not afraid to get ballsy with their marshmallows and put flavors in them. They’re not content with just letting a marshmallow be a simple little puff of sugary sweet goodness. I mean, seriously, who ELSE would think to put SWEET POTATO flavor in a marshmallow, encrust it with crunchy, candied GINGER and turn those simple little puffs (or in this case … HUGE puffs) into spicy, savory, sweet bits of culinary joy? Oh. My. Goodness! These are amazing. So yummy! These puffs evoke thoughts of Thanksgiving dinner when I was a child (which is why I chose to schedule this review for Thanksgiving) … My stepmother would always make sweet potato casserole. And this puff is very much like that sweet potato casserole, only BETTER because first of all, it’s a confection and so it’s OK that this is sweet. (Now that I’m grown I’m a little disappointed that the delicious flavor of the sweet potato was masked by all that sugar and stale, commercially manufactured marshmallow) Second … the ginger on this gives it a fiery heat that my stepmother could never duplicate (she had no clue when it came to spices). The sweet potato flavor is IN the marshmallow itself. 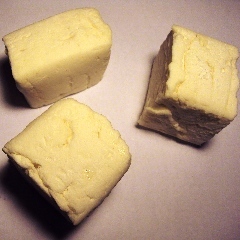 However, if you want to taste the sweet potato flavor, you need to be sure that you bite into a bit of the marshmallow that is not studded with the crystallized ginger. Otherwise, what you’ll taste is mostly spicy-hot ginger. The sweet potato flavor is overwhelmed by the ginger when you bite into the ginger … but when you take a bite into just the marshmallow, you can taste the creamy marshmallow and the sweet, savory taste of the sweet potato. I like to alternate bites, eating some of the puff without the ginger. Its sweet and savory, the sweet potato adds such an interesting flavor to the marshmallow. Then I like taking a bite with the ginger and POW! It’s like a spicy kick in the mouth! I wanted to try these because they sounded so unique (come on… sweet potato flavor in a marshmallow? Aren’t you at least a little bit intrigued?) and I’m really glad I did. I love the contrast of flavors and textures that these puffs provide. A lovely autumnal treat!